Drug addiction has reached epidemic proportions worldwide. 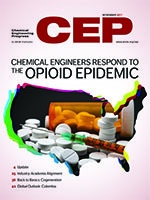 Because chemical engineers have a duty to serve the public and address pressing societal needs, it is critical for chemical engineers to develop processes and products to help prevent and address drug addiction. Other topics in this issue include Industry-academia alignment, back to basics: cogeneration and global outlook: Columbia. Despite dramatic changes in the chemical process industries (CPI) over the past few decades, there has been comparatively less evolution in the undergraduate chemical engineering curriculum. In the article “Preparing Chemical Engineering Students for Industry," Joseph Alford and Thomas Edgar challenge universities to do more to better equip chemical engineering students with the skills they need for their future industrial careers. Many chemical engineering courses do not reflect current practices in the chemical process industries (CPI). How should the core curriculum change to better align undergraduate training with industry needs? A good understanding of steam-turbine operation and power generation cost can help improve overall cogeneration profitability. This article describes the basic economics behind cogeneration. Given its geographic position, abundant natural and agricultural resources, and moderate labor costs, Colombia has the potential to develop a competitive chemicals industry, as long as it is committed to the necessary investment and research.